As Paul came to the end of his earthly life, he took great pains to encourage his disciple to “be strong in the grace that is in Christ Jesus” (2 Timothy 2:1) and to guard and pass on the precious teachings that Paul had taught him. Paul compared Timothy’s life in the ministry of the gospel to the life of a soldier. The Greek word translated “endure hardness” is used twice more by Paul, each in this book. “But watch thou in all things, endure afflictions [same word], do the work of an evangelist, make full proof of thy ministry” (2 Timothy 4:5). Paul holds himself up as an example of such endurance when he claims: “I suffer trouble [same word], as an evil doer, even unto bonds; but the word of God is not bound” (2 Timothy 2:9). As soldiers of Jesus Christ, we are to avoid entangling ourselves with something that will hinder our effectiveness. The word “entangled” means “entwined,” or “involved with.” The soldier must be able to draw his weapon freely and use it effectively, and cannot do so if something is clutching onto him, binding his arms and legs. It is surprising to note that this phrase “hereby know” occurs eight times in the little epistle of 1 John. Each of these listed below is given as a means of both testing the genuineness of our professed faith in Christ and then of giving assurance and comfort to the true believer. “But whoso keepeth his word, in him verily is the love of God perfected: hereby know we that we are in him” (1 John 2:5). “Hereby perceive [same Greek word as ‘know’] we the love of God, because he laid down his life for us: and we ought to lay down our lives for the brethren” (1 John 3:16). “My little children, let us not love in word, neither in tongue; but in deed and in truth. And hereby we know that we are of the truth, and shall assure our hearts before him” (1 John 3:18-19). “And he that keepeth his commandments dwelleth in him, and he in him. And hereby we know that he abideth in us, by the Spirit which he hath given us” (1 John 3:24). “Hereby know ye the Spirit of God: Every spirit that confesseth that Jesus Christ is come in the flesh is of God” (1 John 4:2). “We are of God: he that knoweth God heareth us; he that is not of God heareth not us. Hereby know we the spirit of truth, and the spirit of error” (1 John 4:6). Our American younger generation, like the Hebrew Christians back in the first generation after Christ, seems in grave danger of forgetting the great sacrifices of those earlier generations in this country who made our nation the land of the free. What seems almost a deliberate “dumbing down” of our great Christian heritage has been taking place in our public schools and universities ever since World War II ended. Memorial Day should not be merely an occasion to give people a three-day time of leisure and pleasure, but rather a call to remembrance of those who suffered and died to ensure our political and religious freedoms—especially that freedom to believe and proclaim the saving gospel of Christ, which so motivated our forefathers. And it is even more important, every day, to call to remembrance the unfathomable sacrifice of the Lord Jesus Christ who died, not just to give us temporal freedom, but eternal freedom, providing everlasting life to all those who believe. We have a formal time for remembering this—whenever we observe the special supper He established, remembering His broken body and shed blood. “This do in remembrance of me,” He said (1 Corinthians 11:24-25), and Christians have been remembering Him in this way ever since He met with His disciples the night before He died for our sins. The reference in this text goes back to the “sweet savour” that God smelled when Noah offered his initial sacrifice after disembarking from the year-long Flood. That offering triggered a promise from God that He would never again curse the earth or destroy every living thing with water, as the Flood had done. Furthermore, the Lord promised to maintain the seasons and functions of the earth until the end (Genesis 8:20-21). Later, Moses would bring the Lord’s instructions for those laws of Israel that would keep the nation separate from the rest of the world and constantly remind them of the very personal relationship that the Creator of all things was establishing with them. Some of the sacrifices would be an “offering by fire unto the LORD, a burnt offering, or a sacrifice in performing a vow, or in a freewill offering, or in your solemn feasts, to make a sweet savour unto the LORD” (Numbers 15:3). This little verse gets quoted out of context a lot. It is used to justify bizarre plans and dreams, as well as to suggest that every Christian should be rich and healthy all the time. Not only are such applications without any support in Scripture, they are completely out of the context of this passage. In the previous verses, Paul lists a variety of circumstances that he had faced, from poverty to wealth, learning to be “content” in each of these developments. Then he notes that he “can do all things” through the strength that the Lord provides during conflicting circumstances. 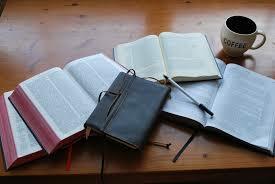 The “do” of this text is the prevailing of the power of God in which and by which we minister. “Not that we are sufficient of ourselves to think any thing as of ourselves; but our sufficiency is of God; who also hath made us able ministers of the new testament” (2 Corinthians 3:5-6). The early church experienced a stunning growth in converts as it preached and testified of the resurrected Christ. This result, however, is due to the fact that the Word of God grew “mightily . . . and prevailed” (Acts 19:20). Our lives are surrounded with ungodliness and demands that often bleed away our thoughts until we are worn and weakened. Reflect for a few moments on this inventory of empowering thinking. Truth—Literally “that which is not hidden”; Jesus Himself (John 14:6); the Word of God (John 17:17; Psalm 119:11). Honesty—Not just accuracy, but “sober” and “venerable”; sometimes “magnificent” or “great”; used of church officers (1 Timothy 2:2; 3:8). Justice—Righteous, just, right, suitable; “The mouth of the just bringeth forth wisdom. . . . The lips of the righteous know what is acceptable” (Proverbs 10:31-32). Purity—Morally and sexually chaste; closely connected with “holiness”; the emphasis is on physical and mental purity (1 John 3:2). Loveliness—Beauty, friendship, delight, and wonder are all suggested by the “good love” of this word (Luke 12:27). Good News—This takes discipline, because there is far more bad news than good in this world; we are admonished to take “inventory” (dwell on, recall) the “good reports” (Proverbs 25:25).